Human space flight is a physically demanding experience. It poses numerous risks, many of them are very evident, but some are hidden to the naked eye. The most important hidden health challenge is the bone density changes that are brought on by prolonged weightlessness. These bone density changes in the hip and back are very similar to those suffered by women with osteoporosis after menopause. Living in a minimal gravity environment during lengthy missions can set up astronauts for hip and spine fractures similar to those incurred by persons suffering from osteoporosis. • Astronauts need to have quantitative computed tomography (QCT) and hip strength assessments pre- and post-flight to measure changes in bone density and strength. • Other methods of testing such as dual-energy X-ray absorptiometry (DXA) should also be utilized to track in astronauts’ bone density. • Modifiable risk factors for osteoporosis such as physical activity and nutrition should be optimized in astronauts. • New pharmacological interventions (Biphospho-nates) which slow bone loss should be investigated. Diet and exercise are important to astronauts, as they are important to persons that are at risk for developing osteoporosis. This involves eating foods which are high in calcium and that are customized to maximize calcium absorption. 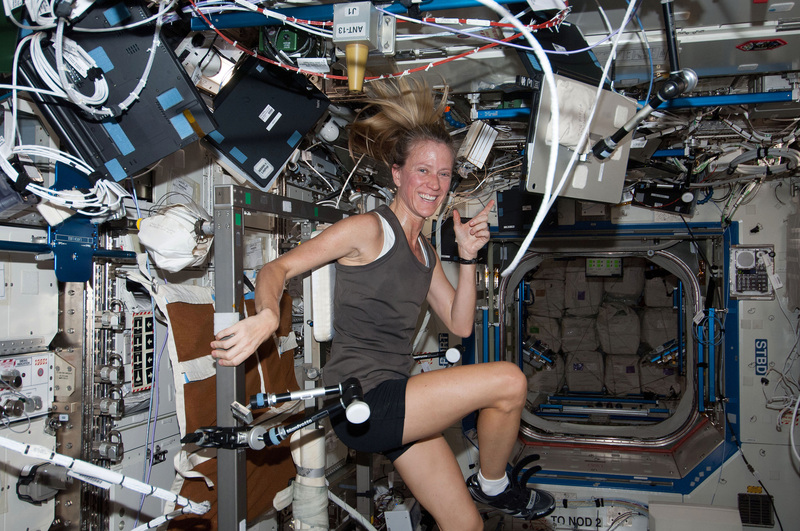 Exercise regimens involve a significant amount of the astronauts’ time in space. They use aerobic exercise and strengthening techniques to help prevent the inevitable bone loss that comes with space travel and weightlessness. Future NASA projects and missions involving manned space travel will involve longer time in space and the issue of bone density will need to be addressed in those making those missions. Through increased study and planned interventions, it is hoped that these negative effects will be minimized through proper screening, monitoring, diet and exercise. Research that is currently being done at NASA on bone loss and osteoporosis will not only benefit astronauts, but also benefit individuals in the general population suffering from osteoporosis. Diet and exercise is important to all of us for good health. It will be essential for survival in space travel as astronauts embark on more aggressive and lengthy missions. Innovation and research will be important in developing methods for our astronauts to protect their bones and stay healthy in space. For information about the research on the ISS go to: www.nasa.gov/mission_pages/station/research. Dr. Anthony Breitbach serves as the Director of the Athletic Training Education Program in the Doisy College of Health Sciences at Saint Louis University. He had previously served as the Director of Sports Medicine for the Saint Louis University Athletic Department for 7 years and has a total of 27 years of experience as a Certified Athletic Trainer. Dr. Breitbach graduated from the AT program at the University of Iowa in 1985, received his Master’s degree from the University of Florida in 1987 and received a Doctor of Philosophy degree in Educational Leadership from Saint Louis University in 2007. He currently serves on the National Athletic Trainers’ Association Executive Committee for Education. He has previously served has the President of the Iowa Athletic Trainers Society and on the Board of Directors for the Mid-America Athletic Trainers Association. In 2011, he was awarded the Dr. Glenn L. McElroy Distinguished Service Award by the Missouri Athletic Trainers Association. Dr. Breitbach is actively participating in research regarding Interprofessional Education and Athletic Training. He also is studying the role that psychological factors and athletic training professional preparation has in student success on the Board of Certification Examination.